This landmark legislation became the basis for an international treaty embraced by much of the world—but not, ironically, by the United States. July 26 marked the 25th anniversary of the Americans with Disabilities Act. Its passage harkens back to a bygone era, when Americans with disabilities could count on bipartisan efforts in the pursuit of life, liberty, and happiness. Congress passed the ADA in 1990, and President George H.W. Bush signed it into law. Some years later, in 2008, President George W. Bush signed the ADA Amendments Act into law, seeking to restore the drafters’ intentions against a judicial onslaught that had effectively gutted the law. Breaking with this bipartisan tradition, the Senate could not garner enough votes to ratify the Convention on the Rights of Persons with Disabilities in 2012. The first human rights treaty of the 21st century, the CRPD is also the first legally binding international instrument with the power specifically to protect the rights of the world’s largest minority: the 1 billion people with disabilities. The Senate voted down the treaty against the advice of two esteemed World War II veterans who acquired disabilities during their service, Senators Bob Dole and John McCain, and a host of other supporters from both parties. A decidedly tepid grassroots response failed to counter an overwhelming surge from right-wing homeschooling parent networks, who oppose the protections. A second attempt to ratify the CRPD in 2013 yielded a second defeat. 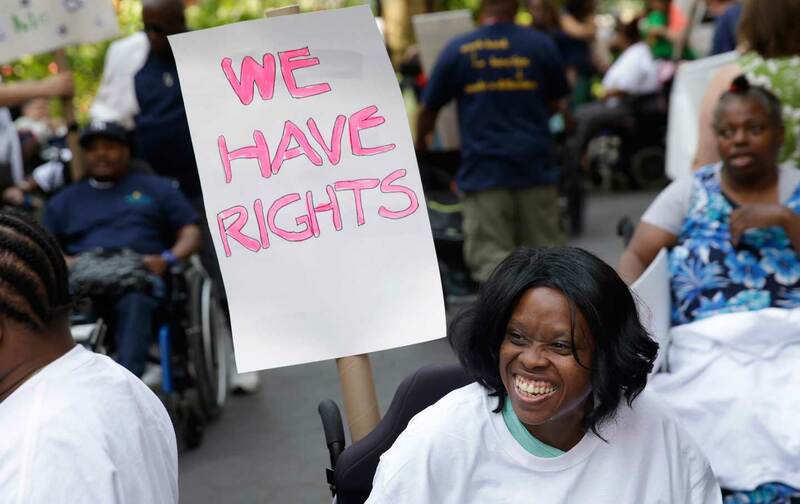 Disability advocates from around the world have long looked to the United States as a leader in opening up space for people with disabilities to thrive and flourish as full citizens. Borrowed in large part from the American disability-rights framework and informed by principles reflected in our disability-rights legislation, the CRPD is designed to secure full participation for people with disabilities in all aspects of life, on an equal basis with others. The Senate voted down the treaty against the advice of two esteemed World War II veterans and a host of other supporters from both parties. In an approach drawn directly from American disability law, the treaty prohibits disability discrimination and mandates the provision of reasonable accommodation that doesn’t impose an undue burden. The CRPD supports full participation and inclusion in the community, as well as independence and autonomy, ideas that are hardly subversive to American values. Indeed, they are the salient values of our republic. This is standard stuff for us—but not for the vast majority of countries around the world with legal frameworks that simply don’t support or welcome the inclusion of people with disabilities in schools, workplaces, recreational facilities, or religious spaces. Many path-breaking US laws on disabilities—the Architectural Barriers Act, the Rehabilitation Act, and the Education for All Handicapped Children Act (now called the Individuals with Disabilities Education Act)—helped set international guidelines and became standardized in the CRPD. That makes the two US failures at ratification all the more striking. Some 157 countries have ratified the CRPD. The Obama administration signed it in July 2009. The White House submitted the treaty to the Senate for ratification after a lengthy and very comprehensive interagency review process and extensive legal analysis. It prepared recommended reservations, understandings, and declarations that mitigate concerns about inconsistencies with our own legal framework. Despite this careful consideration, the Senate voted down the measure. In so doing, it sent the message that this treaty was not for us but for the foreign “others” out there. Fearful that human rights treaties might threaten America’s legislatively entrenched racism, Bricker proposed an amendment to the Constitution that would have made all treaties non-self-executing—meaning, among other things, that individuals would be unable to invoke treaty provisions in US courts without implementing legislation. This would have made it extremely difficult for the United States to join human-rights treaties, helping to preserve racist state legislation. This retrogressive legacy lives on in an enduring resistance to US participation in human-rights treaties that cuts across administrations. There remains a real disconnect between some of the human rights–strengthening activities we pursue abroad in USAID- and State Department–funded programs and what we’re doing back home. During a summer when we’ve been starkly reminded of the deep roots of racism in our country, treaty ratification would signal a move beyond our cultural resistance to human rights treaties—and beyond the legacy of stalwart defenders of segregationist laws. Until the Senate looks more favorably at ratifying the CRPD, I support Patricia Morrissey’s suggestion. She’s the president of the US International Council on Disabilities. “At a minimum we should amend section 504 of the Rehabilitation Act,” she says, “which prohibits discrimination on the basis of disability in federally conducted programs or activities and in federally financial assistance awarded in the U.S., by deleting ‘U.S.’, and extending the reach of section 504 overseas.” Such a move should trigger bipartisan support. According to Jacobus tenBroek, a renowned law professor and legal scholar who was also blind, the United States wants Americans with disabilities to be abroad in the world. And we, as the longtime leader in disability rights law, policy, and practice, want a seat at the table as an unprecedented era of law reform and policy development occurs around the globe. Americans with disabilities deserve nothing less. Janet E. LordJanet E. Lord is senior vice president for human rights and inclusive development at the Burton Blatt Institute, Syracuse University. She is also a senior research fellow at the Harvard Law School Project on Disability, adjunct professor of law at American University Washington College of Law, and a contributor to Foreign Policy In Focus.